1. Mechanical forming can be done by either rolling the convolutions between external and internal wheels. 2. Hydraulic forming, using internal pressure has a much greater life than bellows formed by the other method(s). Bellows shall be hydraulically formed from a tube having only longitudinal seams. When the ratio of corrugation diameter to shell diameter is large, as in small diameter bellows, the units shall be annealed to remove stresses created by the forming operation. The number of convolutions depends upon the amount of movement the bellows must accommodate or the force that must be used to accomplish the deflection. 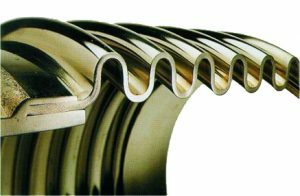 Since bellows are unique, there are many design considerations which must be evaluated. The convoluted element must be strong enough circumferentially to withstand the line pressure of the system, yet responsive enough longitudinally to flex. The longitudinal load (pressure thrust) must then be absorbed by some other type of device. These are usually anchors, tie rods, hinges or gimbal structures. Under pressure a bellows will crave to squirm. This can occur when a bellow is subjected to a pressure greater than 1.5 times the design pressure. Squirm can be considered the same as column buckling in a beam under compressive loading. The convolutions deform and even though there is no leaking, both cycle life and pressure capacity is greatly reduced. Is a lower grade material than 321 SS with less resistance to corrosion. Applications include diesel engine exhaust manifolds and steam. The most common material used for bellow manufacture. It combines excellent mechanical properties with adequate corrosion resistance. Applications include diesel engine exhaust manifolds and steam. Has a better corrosion resistance than 321 SS and can be used as an alternative to Incoloy 825. Applications include engine exhaust manifolds, steam and marine services. A high nickel alloy specifically designed for use in aggressive environment. It is very resistant to pitting and crevice corrosion and virtually immune to stress corrosion cracking. It can be used up to a maximum temperature of 425° C. Applications include diesel engine exhaust manifolds, steam, crude oil lines and flue gases. Is a high nickel alloy with good corrosion resistant and temperature capability higher than 425° C.
This alloy has good mechanical properties and excellent corrosion resistance to alkalis, i.e. sodium hydroxide. It also has good electrical, thermal and magneto-strictive properties. Applications include food and synthetic fibre processing, heat exchangers, chemical and electrical industries. This is a very high end austenitic stainless steel that combines impact toughness resistance to chloride stress corrosion cracking, pitting and crevice corrosion with strength nearly twice that of 300 series stainless steels. In some applications it has been found to be a more cost effective substitute for high nickel and titanium alloys.